MLB released its Spring Training Umpires roster for 2016, which includes all 75 umpires on the full-time Major League staff, plus 20 minor league umpires invited and assigned to baseball's Spring Training in Arizona's Cactus and Florida's Grapefruit Leagues. The Spring Training roster below also includes sleeve numbers for all applicable umpires, including Minor League call-up umpires authorized to fill in at the Major League level during the regular season. " 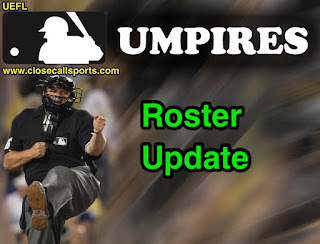 --" indicates umpire is a Minor League (AAA) official invited to participate in Major League Spring Training, but has not been given a sleeve number for the MLB regular season fill-in list. Newcomers to the MiLB Call-Up list are indicated by bold text. > MiLB invites dropped by two (from 2015), while full-time MLB umpires decreased by one. > 2015 Full-Time MLBU Paul Schrieber is not returning to the Major Leagues. A league source indicated on condition of anonymity that the departure was not voluntary or previously planned. > Umpires who appeared on the 2015 Spring Training MiLB invitee list, but who have been cut from the 2016 preseason are: Jon Byrne, Jeff Gosney, Marcus Pattillo, and Doug Vines.